Our theme is packed full of features that will take your store to the next level! You already know why your site should be mobile responsive right ? Your Customer love it and search engine too. no reason you don't love it right. Customer satisfaction is our top priority, don’t hesitate to contact us. We will try our best to reply within one business day. 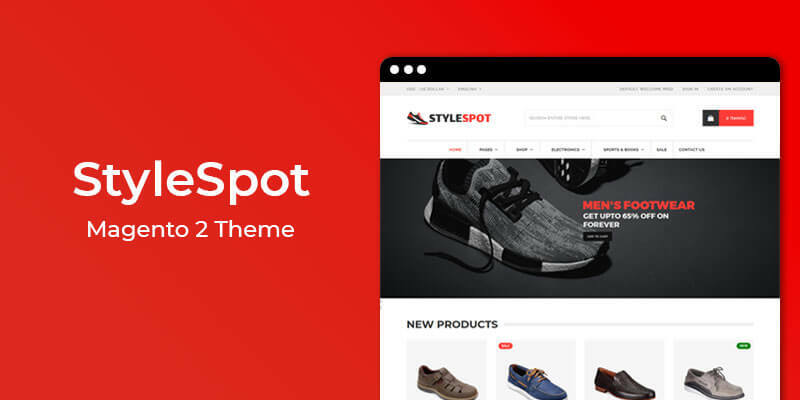 Stylespot is a professionally design premium responsive Magento 2 theme. Stylespot is perfect for Fashion Store, Accessories Store, Shoes Store, and Apparel Store. With premium features included in our all themes! Newsletter helps to share your promotional messages with your customer. Easily engage customer with your store. Mega Navigation create dynamic menu ever. This helps merchants to create a better look and professional navigation menus easily. Sticky add to cart provides hassle free shopping experience to customers. A customer can quickly add a product to the cart without scrolling. Present your product in the best ways. Product tab functionality allows you to add products tabs like size charts, specifications, shipping rules. Sticky header with navigational elements will help customers to route their way around a store. Here you can easily enable sticky header. Sales Countdown Timer allows you to quickly and easily add a real time countdown bar to create urgency and Fear of Missing Out (FOMO). The Promotion Bar is mobile optimized and appears on every page of your website/store, in order to attract the customer's attention in a non-invasive efficient way. Instagram Gallery is professionally designed Magento 2 extension that allows you to easily add your Instagram feed in your Magento 2 Store. Category Slider Widget allows you to showcase your categories in unique & attractive way. Navigate your customer with actionable categories & built your brand trust. Copyright © Stylespot All rights reserved.